On Thursday, September 27, The Texas Music Office launched its inaugural benefit concert supporting its Texas Music License Plate Grant Fund, featuring music from the Josh Abbott Band and Rob Baird. The benefit concert was co-sponsored by Bud Light, Floore’s Country Store and Y100 San Antonio’s New Country Leader radio station. During a concert intermission, Anheuser-Busch’s Sr. Manager of Experiential Marketing Doug Mraw presented a check to TMO Director Brendon Anthony for $5,000 that will go directly toward grants for Texas school children to receive music instruments and lessons, as well as toward community music program grants. "We want to ensure the kids who need it have the tools that they need to continue [music] education opportunities," Anthony explained to FOX News at Nine Anchor Jessica Headley during a pre-show interview. "[The grant program] creates lessons if a kid needs them, instruments if a kid needs them…creating music programming opportunities for under-served communities." Since it began in 2004, the Texas Music Office’s License Plate Grant Program has contributed more than $132,000 to music education opportunities across the state via sales of its Texas Music license plate for cars and motorcycles. 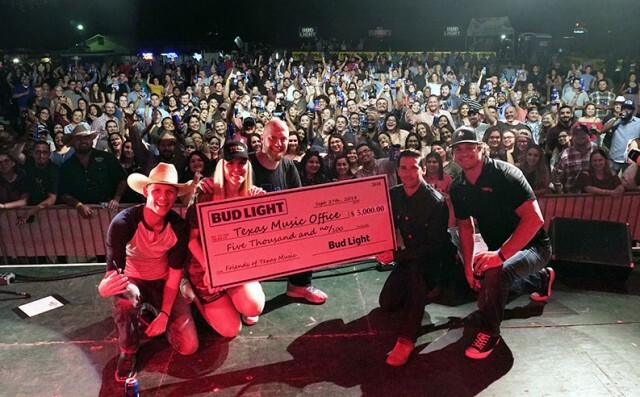 The TMO aims to expand its outreach concerning how license plate sales contribute to the grant fund with events like the one Anheuser-Busch hosted at Floore’s Country Store in Helotes, TX; Anheuser-Busch covered all costs for the concert allowing Texas musicians Josh Abbott and Rob Baird to perform free-of-charge to the public. "One of our biggest goals is to raise awareness which hopefully leads to increased donations," Mwar said. To learn more about the Texas Music Office grant program, click here.